68" X 31" X 33"
Are you looking for wooden bath tubs for your rustic home or cabin? A wooden bath tub is a great addition to your home if you’re looking for something unique and interesting for your home. You can buy a wooden bath tub that not only functions as a bath tub but that can be used as a soaking tub or shower as well. 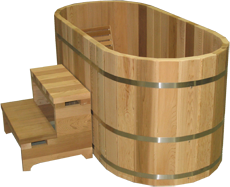 Most wooden bath tubs are made from solid cypress or cedar that is crafted into a tub by experienced craftsman. Cedar is used because it is resistant to moisture and rot. The natural oils in cedar allow it to withstand, shampoos, and shower gels. You can find wooden bath tubs locally if you live in a larger city. Specialized craftsmen can custom make just the bath that you’re looking for depending on size and type of tub that you want. If you don’t live in an urban area you can use the Internet as a source of information for wooden bath tubs. With a bit of searching you can find wood tubs that are crafted around the world and offered for sale. If you have a cabin that you’re attempting to furnish in a rustic style for those weekends away, you might want to have a wooden tub that is large enough for the deck area. Many wooden bath tubs are used for hot tubs as well. This is a great way to bring the comforts of a spa to your deck while still enjoying the luxury of a wooden tub. With so many different styles to choose from you can soon be enjoying a hot bath in your new wooden bath tub.